You may know and love the local products we produce and sell at Spragg’s Meat Shop, but how much do you really know about our people, who work so hard behind the scenes? 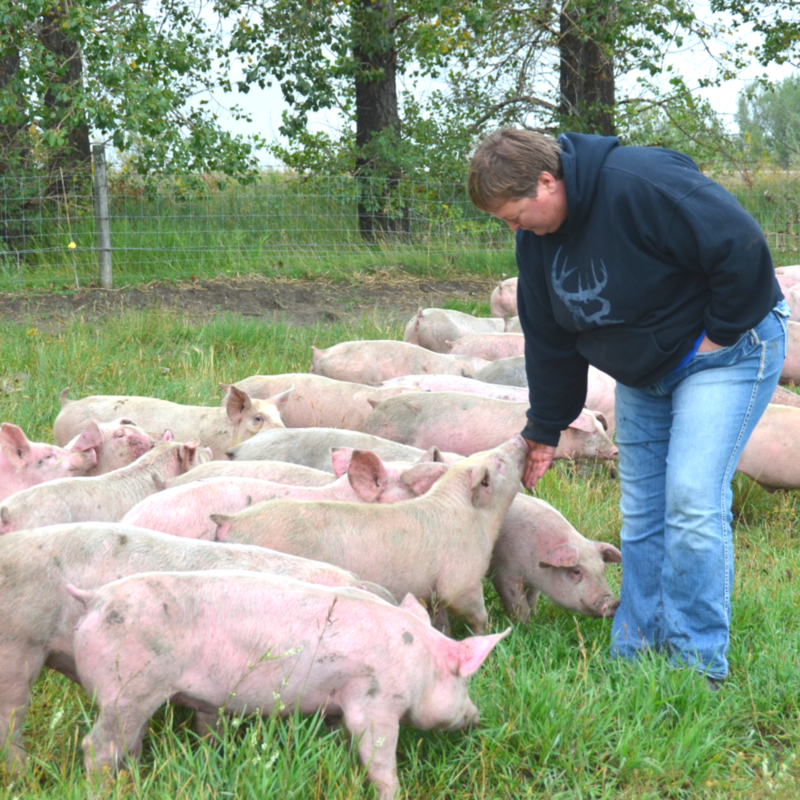 Spragg’s Meat Shop has been an Alberta-based family business since 2005. Led by husband and wife team, Greg and Bonnie Spragg, we are proud farmers, business owners, parents, and so much more. Over the next few weeks, we’re excited to be rolling out our Q&A blog series. With each installment, you’ll learn more about who we are, what we do, and how we do it! First up, check out our Q&A session with co-owner and Rosemary Meat Shop manager, Bonnie Spragg! Q: Take us back to the beginning. How did you get into farming? When did you start Spragg’s family farm and business? When we met, Greg and I were both working at different local farms. When we got married, we bought our farm together. For the first few years, as we were building up our farm and free-range hog operation, we continued to work outside jobs. However, we never lost sight of our vision. Today our farm is a full-time family affair that includes our daughter Ruth and our amazing staff! Q: How are you unique from other local farmers and producers? What makes Spragg’s special? We decided to try farm-direct marketing. Most farmers produce crops or livestock and sell them to food processing companies. The producer and processor model has been really rewarding, as it allows us to be more connected with our customers. Q: How early on did you introduce your daughter Ruth to the business? Any favourite memories? Ruth was at her first farmers market when she was two weeks old. We have operated as a family farm from day one. Numerous members of our extended families have worked with us, or helped out over the years. Q: What is your role today at Spragg’s Meat Shop? What does a day in the life look like? I help sort and load pigs on the farm side. When we need two people to perform tasks, I am the second person. I manage the meat shop on a daily basis, making sausage, operating the smokehouse, and managing orders and inventory. In my free time, I do the bookkeeping and paperwork. Q: As a business owner, mom and wife, what’s non-negotiable for you? We are only doing this as long as we enjoy it. If this ever feels like work and not life, it’s time to stop. So far, we keep saying that we haven’t worked a day in our life. I am proud of the brand we have built. We never set out to make Spragg’s Meat Shop a household name in Alberta. We were simply trying to build a viable farming operation. Q: What drives you to keep going when it’s really tough? Greg and I feed off of each other to get through the tough, slow, or crazy workdays. Another thing that I like to do is sell at our farmer’s market booths for a day. Connecting with our happy customers is extremely rewarding, and it’s very satisfying seeing the end result of all of our hard work! Q: Do you have a favourite cut, product, cooking tip or recipe that you can share with us? Sweet and sour spare ribs on steamed rice are my favourite! But, I hardly ever cook them. Someday it will be a ready-to-heat meal that we sell, so that I can eat them once a week. Q: What can we expect next from Spragg’s Meat Shop? What are you most excited about right now? We haven’t had time to work on new products for a couple of years. I am excited to roll out some new pork sausage flavours and other new things, this spring / summer!